Jackdaws are the smallest member of the crow family being just over half the size of the rook, carrion or hooded crow. From a distance they look all black but at close quarters they have a conspicuously grey top to the back of the head and have dark grey underparts. Compared to the other crows the beak is short and stubby and they have much rounder wings. The shape of the wings enables the birds to hover in the air revealing darkish bands on the under wings and a dark grey tail. Flight is light, agile, but can sometimes appear jerky but the birds are very acrobatic and they will often tumble and free fall especially round cliff faces where there is an upstream of air. On the ground it has a rapid walk interspersed by runs or hope. What gives the birds away, whatever they are doing, is the constant raucous call notes that even sounds like ‘jack’. Some people believe that this is why the bird is called jackdaw but this is not clear as it also means small which suits the smallest member of the crow family. The birds have long been associated with myth and folklore and if a pair bred in a house chimney it predicted death for someone in the house. In the Highlands in the early 1900s jackdaws increased in numbers and range with a few birds colonising some of the islands off the coast. Then there seemed to be a period of stability but then in the 1970s, when many other birds have been in decline, the numbers rose again. Studies have shown that the numbers of jackdaws in woodland has been increasing and the breeding success is getting better with fewer nests failing and the size of the broods is increasing. Currently the birds are found in many parts of the Highlands and to a lesser extent on the Northern and Western Isles. It is noticeably absent from the north-west and western parts. Part of the success is the birds ability to live and breed in a wide variety of places such as gardens, farmland or hills and they will form large colonies on cliffs and even in rabbit holes. They can be seen scavenging along the shore line and rubbish tips and they readily go to bird tables in even small gardens. 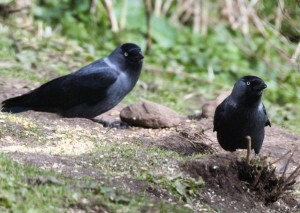 The photograph shows two jackdaws under a bird table in a garden near Inverness. At this time of the year jackdaws will feed in fields alongside cattle and sheep. They feed on seeds, fruits and berries, scraps put out by people and will take eggs and young birds. Like the other crows they will sometimes store food. Young birds are often left in a crèche in trees or on cliffs whilst the majority of adults go off to find food. Jackdaws are very sociable birds and in the summer and winter they will often form large flocks with rooks and carrion/hooded crows. These feed mainly in the straths and glens round Inverness and will sometimes form huge roosts with several hundred mixed bird being involved. Where such roosts are in trees, as is often the case, the accumulation of droppings can adversely affect the plant life below and even the trees. The birds are both residents and migrants as some birds will leave the bleak upland areas in September and November so that they can feed in richer pastures and some even go to Ireland. Other jackdaws from Northern Europe arrive between October and November and leave again between mid-February and April. This entry was posted on Thursday, October 18th, 2012 at 9:26 am and is filed under Wildlife in the North .